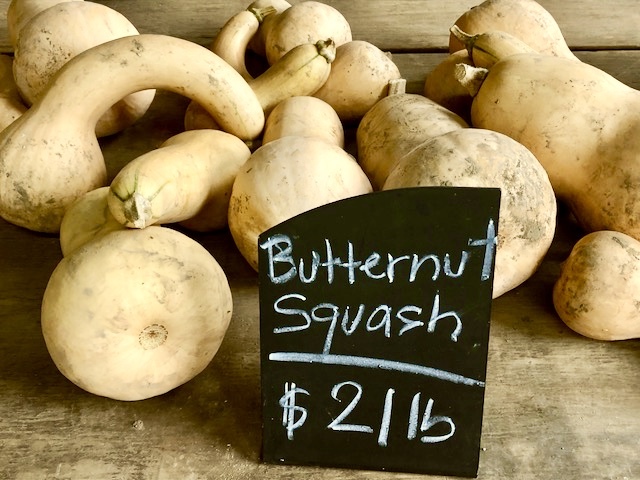 Butternut squash is probably the most beloved of winter squash, likely because it is the most familiar, having been stocked in supermarkets for decades. Frankly, what’s not to like. It’s flesh is mild and it’s flavor is irresistibly nutty. Did you know that squash is technically a fruit? Yet is is prepared mostly like a vegetable. Roasted is the favored way to cook butternut squash, but it can also be steamed, grilled, or sautéed and can be used in any number of preparations. Butternut squash makes wonderful soups/purees, as well as casseroles and pastas (like macaroni and cheese) (see recipe below). It lends itself well to roasting and stuffing, roasting and adding to leafy or grain salads, and pureed, can even be used in baked good for moisture and flavor. Lately butternut squash has been offered in supermarkets in spiralized and fry shapes. I like to use it chopped fine as a substitute for rice (see recipe below). You may not believe it, but butternut squash can even be eaten raw (see recipe link below). Because the skin of butternut squash is so tough, it can be tough to peel. One easy way to deal with this problem is to microwave it first to soften the skin. To do this, cut off the top and bottom of the squash. Microwave it whole on high for 3-5 minutes. Remove from the oven. Cut the squash where the neck ends and the bulb end begins. Set the two squash pieces on a sturdy cutting board cut side down. Using a sharp knife, cut from top to bottom in strips to remove the skin. 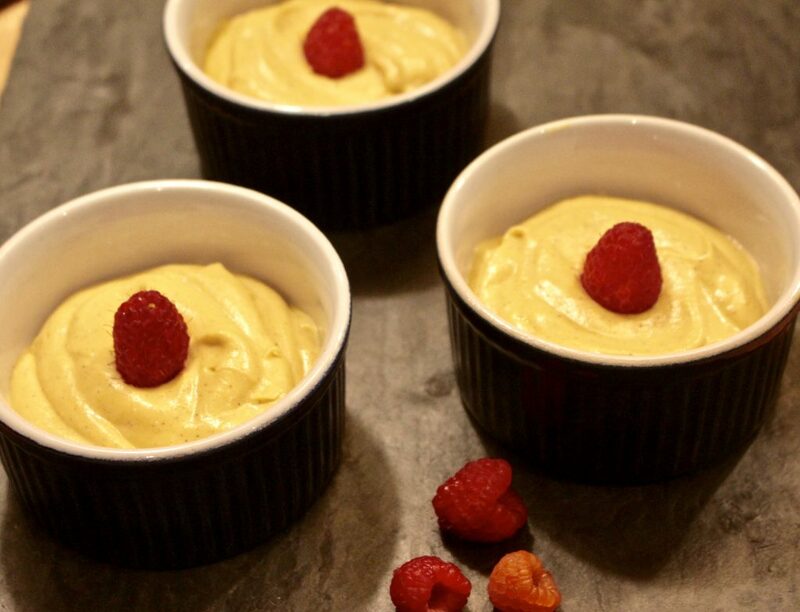 Going with the fact that winter squash is actually a fruit, I came up with this no-cook, vegan pudding recipe as a fun way to use butternut squash. Drain cashews well. Place in a blender. Place butternut squash pulp in a fine mesh sieve. While working over a bowl or a sink, press down gently on the solids to remove excess water. Place 1 cup sieved pulp to the blender with the cashews. Add the rest of the ingredients. Starting on low, process mixture, gradually adding speed and blending until mixture is completely smooth and has a pudding consistency. Spoon pudding into ramekins. Serve immediately or refrigerate. The following is my favorite macaroni and cheese recipe. It was developed by Ellie Kreiger and printed in the cookbook, The Foods You Crave. The base for her recipe uses purchased frozen squash, but I have added instructions for making it from scratch with fresh butternut squash. Preheat oven to 400. Cut squash in half and place cut side down in a casserole dish with a little water in the bottom. Cover with foil and bake until very tender, about 30-45 minutes. Remove foil and let sit until cool enough to handle. Scoop out squash flesh, leaving skin behind. Place flesh in a food processor or blender. Puree until completely smooth (this step ensures a silky smooth sauce). Can be made two days ahead. Cover and refrigerate until ready to proceed. Preheat oven to 375. Spray a 9 X 13 casserole dish with cooking spray. Set aside. If using onion, heat 2 teaspoons olive oil in a medium pan over medium-low heat. Add onion and cook, stirring occasionally, until tender, about 8 minutes. Increase heat to medium. Add milk, squash puree, salt, dry mustard and cayenne. Cook, stirring occasionally, until mixture begins to simmer, about 5-7 minutes. Remove completely from heat. Immediately add ricotta, whisking until smooth. Gradually add sharp and Monterey Jack cheeses, whisking continuously until cheese is melted and fully incorporated into the sauce. If cheese is incorporated too fast it may not “melt” correctly into the sauce, leaving a gooey mass at the bottom of the pan. Taste for salt level and add more if needed. Meanwhile, boil pasta in a large pot of water until just barely cooked (it should still have a bit of a bite to it–it will cook more in the oven). Drain. Pour drained pasta back into the pan and pour cheese sauce over it. Mix until thoroughly combined. Pour into prepared casserole dish. Sprinkle with breadcrumbs and Parmesan. Bake, uncovered, for 20 minutes, or until bubbly and beginning to brown. The following recipe is one of my favorite fall and winter side dishes. It goes great with almost any roasted or grilled meat, but is especially good with lamb. It is a great recipe for those looking to stay away from simple starches like rice or pasta. 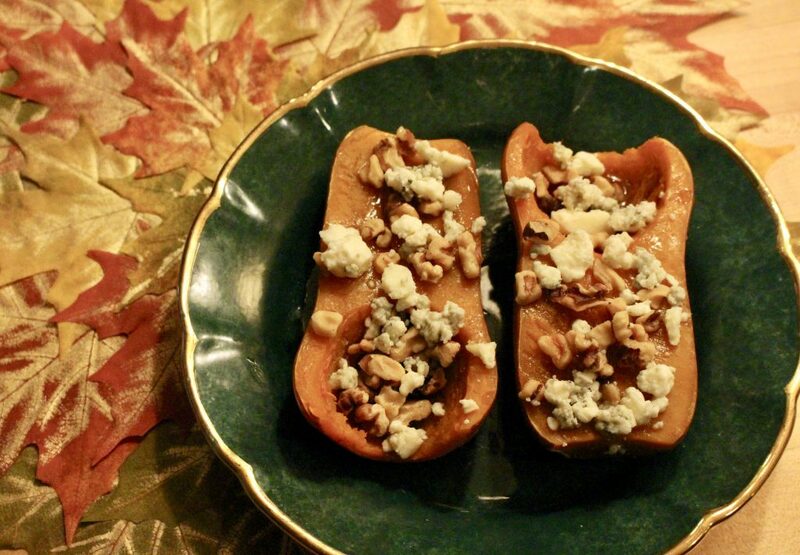 Honey nut squash are mini, sweeter versions of butternut squash. They are delightfully sweet and nutty. For a nice introductory article on this squash variety click here. One really nice thing about honey nut squash is that the skin is tender enough to eat so no need for tedious peeling. Plus, because they are small, they cook faster than whole butternut squash. 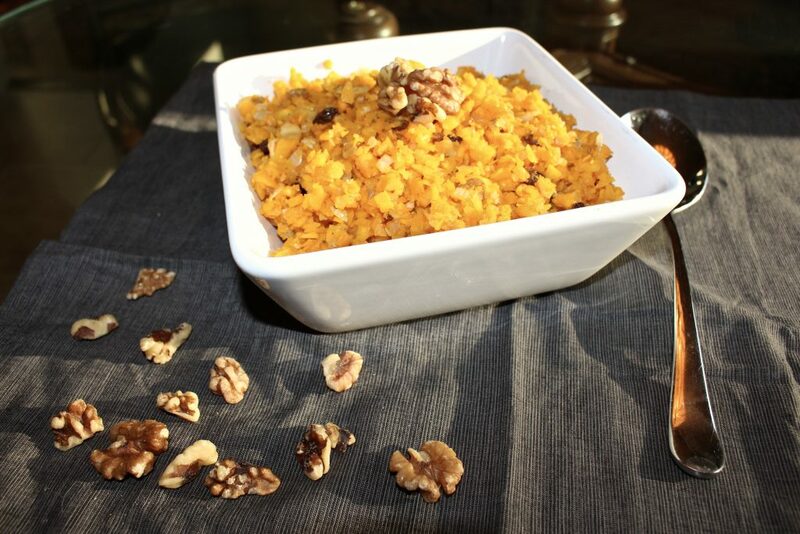 I couldn’t resist coming up with a recipe on honey nut squash using, yes you guessed it, honey and nuts. While this dish would make a great side dish, I had it for lunch. Yum! Preheat oven to 400℉. Oil bottom of a baking dish. Place squash halves skin side down. Cover tightly with foil. Bake for 40 minutes or until squash is tender. Remove from oven and uncover. Place squash halves on serving plate(s). Drizzle with honey and then sprinkle with toasted walnuts and crumbled gorgonzola. Serve immediately.